The rigor is in the answer, not in the question. 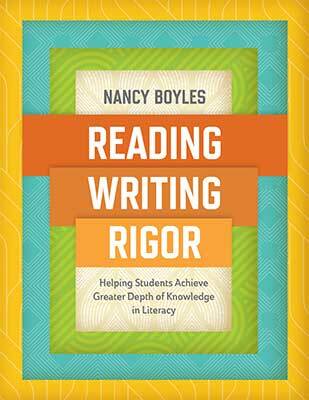 This webinar, which highlights Nancy Boyles' new ASCD book Reading, Writing, and Rigor, will help you develop a deeper understanding of rigor in literacy—what it is and what it looks like in today's standards-based instruction and assessment. Explore the connection between rigor and depth of knowledge and identify questions and tasks that require rigor at all levels of complexity. Learn about practices that promote rigor and resources to support both teachers and students. Determine your next step in making rigor a classroom and schoolwide priority. Receive a classroom-ready handout that features a summary of key points, sample anchor chart, strategy guidelines, rubric, and more. Nancy Boyles is a former classroom teacher and professor emerita at Southern Connecticut State University, where she was professor of Reading and Graduate Reading Program Coordinator. She now consults with districts and other organizations and agencies, providing workshops, modeling best practices in classrooms, and assisting with curriculum development.